This (in 1896) will soon be another addition to the educational institutions of the town, and, like most of the other institutions, is indebted to the liberality of her citizens for its existence. By the will of the late Peter Brough, £300 yearly was allocated for establishing a Science Lectureship. The trustees, however, instead of setting up such a lectureship, laid aside this sum annually, which, with a surplus from another part of the will, has now accumulated to £15,000. Messrs J & P Coats have added £3,000, and also given the valuable site in George Street, with the buildings therein, formerly used as their dye works. In addition, the Directors of the Government School of Art, whose premises are in Gilmour Street, have agreed to hand over to the Technical School Governors their whole property, funds and effects. With these accumulated sums the Governors have been enabled to take steps for the erection of the building. Premiums having been offered for designs, the one prepared by Mr T. G. Abercrombie has been successful, through whose courtesy we give the accompanying sketch. Besides various rooms, lavatories, etc., it will contain an art lecture hall for 300 pupils; a lecture hall for mechanical engineering, etc., to accommodate 200 students; a chemical lecture hall for 110 students; and a physical lecture hall for 100. The Above is taken from the 1896 Guide to Paisley published by J & R Parlane. 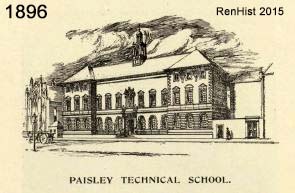 The Technical School eventually became Paisley College of Technology, and this building became known as the Gardiner Building. It now hosts the Business School of the University of the West of Scotland.